I don't know what Tom specified on the original plans (I need to buy a set from the Wooden Boat store), but this particular Blue Moon has flush decks, right to the edge of the boat. Not even a toe-rail. While this keeps her lines clean, I like to have a little something between me and the deep-blue sea as I'm crawling up to the foredeck. My Blue Moon... Raised deck amidships, no toe rail. I liked the idea of full length bulwarks, but the Blue Moon has such a sheer that it will be a big job to get them to fit properly without severe edge set. So as a temporary measure, I decided to just add them to the raised-deck section. I think they'll look okay for my voyage, and it will be an easy matter to unbolt the short sections and replace them with full length bulwarks when I have more time. That's one of the great things about wooden boats. You can change them. Wow, what a concept! 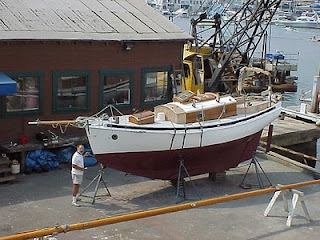 I decided to use George Buehler's "Bulwark System 1", as discussed on page 151 of his Buehler's Backyard Boatbuilding . 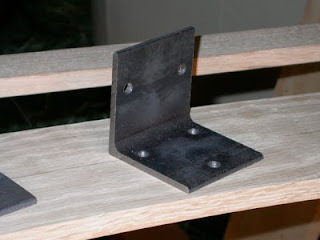 With this simple system, you bolt steel brackets to the deck every 2-4 feet, and then bolt a plank to these brackets for the bulwark. 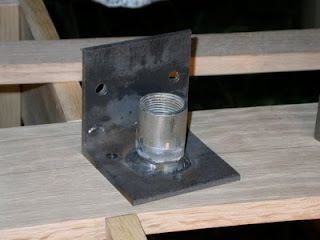 George recommends 3/16" thick, 3" steel angle for the brackets. This is heavy duty stuff, so don't even think about cutting it yourself. I got these cut by Steve at Fleisher Tube here on Long Island, for like $5 each. Oddly enough, the 5/16" holes in the bracket are more expensive than the steel itself, so I drilled the holes myself, using a friend's drill press. 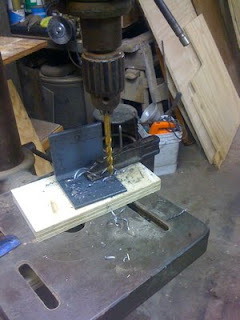 Drilling the holes is easy if you have a good drill bit and if you clamp the bracket to the bed of the drill press. You don't want that baby flying around on the end of your drill! Just mark your holes, make a dent at each location with a metal punch, and put a drop of oil in the dent before drilling. Easy-peasy. Then I had Gary from Master Weld in East Northport weld a 3/4" inside diameter steel pipe coupling to half the brackets. Make sure the coupling is smooth on the outside... the rough ones are cast steel and are not strong enough, according to Gary. When you are done, you have a combination bulwark bracket and lifeline stanchion base. These babies are incredibly strong. Just screw in a 3/4" steel pipe, run a steel wire through the top, and you've got lifelines you can bet your life on. It's hard/expensive to get steel galvanized in this day and age, so Steve recommended having these brackets 'metalized' and 'powder coated'. This is a faily low-cost solution that sounds pretty effective, so I'm hoping I have time to have this done before I leave. Otherwise, I'll have to slap a coat of Rustoleum on them till I have time to redo them in the summer. I am working on Cabin Boy's planking at the moment, and hope to have some pics of that tomorrow. Hi John. Two gorgeous little ships. I think Bulwarks will be a great addition to your boat. I am planning to do a similar style with mine that you just reminded me to give it more consideration re execution. 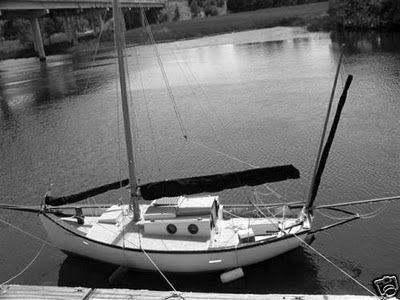 I miss the bulwarks on our first little gaff rigged cutter. They really give one an added sense of security. I used to scramble forward without even looking to where my feet were placed when heeled over knowing I wouldn't slip off the deck. Thanks for this blog. Dave, Yes, I think they are going to be great. Can't wait to see how they look.